Billboards attacking Republican Gov. Rick Snyder for his tax policies appeared in April in Ann Arbor and suburban Detroit. 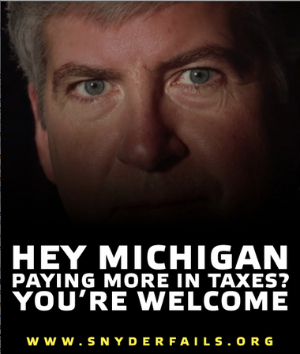 They featured a sinister-looking portrait of Snyder above the sarcastic remark about paying more in taxes. The billboards were paid for by Progress Michigan, a liberal advocacy group with ties to organized labor. A contract for a third billboard in Lansing was not fulfilled. Progress Michigan claimed that decision was due to politics, citing an an email from a sales manager for Adams Outdoor Advertising that explained the contract would not be “in the best interest of Adams, as we are really trying to continue to maintain good relationships with the governor's office.” A general manager for Adams said the contract was not fulfilled for logistical reasons. Freeze the state income tax at 4.25 percent. It had been scheduled to fall to 3.9 percent by 2015. That was calculated by the House Fiscal Agency to raise $223 million in taxes in 2012-2013. Lower deductions for pensions for those born 1946 or after, adding an estimated $343 million in taxes. Reduce low-income tax credits from 20 percent to 6 percent, adding $261 million in taxes. Lower homestead property tax credits, raising taxes by $270 million. Eliminate a variety of tax credits, including those for donations to colleges, community foundations, public libraries, museums and homeless shelters. That adds $104 million in taxes. The net impact in 2013 on a couple with two children earning $55,000 a year would be a state income tax increase of $739, the Fiscal Agency calculated. A married couple with two children earning $32,000 would see an increase of $396. Snyder touts the business tax cut as a jobs creator that makes Michigan more competitive. That is difficult to prove, since a multitude of factors – including consumer confidence, interest rates, fuel prices and national and global trends – influence economic growth. State unemployment stood at 9.2 percent in January 2012 when the tax shift took effect. The rate in March was 7.5 percent. National unemployment fell even more sharply during that period, from 8.3 percent in January 2012 to 6.3 percent in April. The state posted the 18th fastest growth in gross domestic product in 2012, at 2.2 percent, down from fourth fastest in 2011 at 3.5 percent, according to the U.S. Bureau of Economic Analysis. Emily Benavides, Snyder campaign spokesperson, said Snyder inherited a $1.5 billion deficit and "made tough decisions for the right reasons." She noted the drop in unemployment and said that private sector employment has gone up by a quarter million jobs since Snyder took office. While Snyder cut taxes for business, residents saw a $1.4 billion increase in taxes. That includes taxes on everything from personal income to pensions and homestead property as well as higher taxes for low-income residents. The ad appears to be directed to Michigan residents, rather than businesses, and thus its message is factually correct, regardless of whether these tax changes led to more jobs. And I read in last night's paper that the State will be $422 million short this year and $451 million next year while the legislature steals money from other programs to fund roads so they do not have to raise taxes even more. Taxation Propaganda 101 - If it helps you (or your target audience), it's called a credit or deduction, if it helps someone else (probably your opponent), it's called a loophole or give-away. Relative equity or simplicity, economic distortion, or incentive has nothing to do with it and should never be brought up. Snyder's policies are terrible for Michigan. He is damaging the middle class and working poor to benefit his masters - Koch, Devos, and the Mackinac Center loons. And most of Michigan doesn't like what he's doing. His job approval in hovering in the high 30s. And people are especially angry about what he has done to public education. He is trying to dismantle a system that most in the state like. And raising taxes and fees on the middle class and working poor just makes it even more difficult for the state's economy to improve. If the majority of us don't have money to spend the economy suffers. We will GOTV in numbers like 2008 and 2012 and he will be gone. He does not deserve the power he has and we plan on giving it to someone who will protect and stand for all of Michigan - not just the 1%. And yet Patti he will get re-elected easily, defeating a no-name challenger. Why? Because things are basically better than they were under 8 years of the previous administration. You are kidding yourself if he think he wont get re-elected. Despite the millions likely to be poured into his rival via organized labor as you see, everyone has a dark master. Grady, Devos and the kochs will pour 10xs the money into snyder's re-election efforts than labor will for the Democratic candidate. There was NO deficit. Even if there was, shifting taxes does NOTHING to settle a deficit. The budget Snyder inherited, as required by the Michigan constitution and passed by the Republican state senate, house and signed by the Democratic governor, was balanced. DUH. You'd think the Nerd would know that already. People don't see the real picture or the big picture. You are all basically right, the 1-2% profits from his policies while the middle and lower class suffers. From a political stand point, if the economy is good, he will be re-elected, if it is perceived to be bad, he will be thrown out...do I like that? No, but that is the reality. Realistically, what a governor does hardly impacts their administration, the effects come out later. Engler caused a lot of the pain that Granholm lived with, (he cut everything when times were good and had a massive amount of state workers walk out the door on September 30th, with little or no plans for transition) and some of her actions are helping and possibly hindering Snyder. Snyder's will be felt in 5 years or so and yes, it will harm schools and others already commented on.